If that melody has just come to you, and if you know your way around a score, you might be able to think it into being now a group of researchers have developed a new brain-computer interface (BCI) application. Brain-computer interfaces (BCI) have been used to help people impacted by physical impairments to control prosthesis designed to be powered by their thoughts, enabling them, for example, to surf the internet and write emails. Work conducted by the MOREGRASP project and the "Feel Your Reach' fellowship, both supported by the EU, has fed into the findings of a team of researchers, led by BCI expert Gernot Müller-Putz from TU Graz's Institute of Neural Engineering. The team has just published a paper showing that thought can power the transference of music from the composer's brain to a score. The group working on the "Brain Composer' project built on an established BCI method which can transfer thought to script, known as the P300 event-related potential. This is a well-known pattern in the electroencephalogram (EEG) used for many different BCI applications, such as environmental controllers, web browsers, or for painting. The team adapted the P300 pattern to compose music. The Brain Composing system they designed consists of three parts: the EEG acquisition system, the P300 control software, and the music composing software. For signal acquisition, the team used a gel-less, biosignal acquisition system. Additionally, a universal P300-based BCI control system was connected to a powerful, open-source music composing software MuseScore 1.3. Seventeen participants (all able to play an instrument to some extent) and one professional composer received some training in the use of the application. They then performed a copy-spelling, a copy-composing, and a free-composing task with the system, 'thinking' melodies onto a musical score. Adhering to user-centered design guidelines, researchers investigated the efficiency, the effectiveness and subjective criteria in terms of satisfaction, enjoyment, frustration, and attractiveness. The musical participants group achieved high average of accuracy: 88.24 percent (copy-spelling), 88.58 percent (copy-composing), and 76.51 percent (free-composing). The professional composer surpassed these: 100 percent (copy-spelling), 93.62 percent (copy-composing), and 98.20 percent (free-composing). 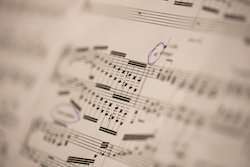 The subjective criteria evaluation revealed users were highly satisfied with the application, which can be seen in action in the "Sheet Music by Mind' video. The paper explains that this is the first step towards a music composing system for severely disabled people. In the light of the feedback received from participants, the team has fine-tuned the software developed. The paper explains that this is the first step towards "(…) a Brain Composing system as a tool for entertainment and, even more importantly, self-expression for severely disabled people." The aim of the MOREGRASP (Restoration of upper limb function in individuals with high spinal cord injury by multimodal neuroprostheses for interaction in daily activities) project is to develop a non-invasive, multi-adaptive, multimodal user interface, including a brain-computer interface (BCI), for intuitive control of a semi-autonomous motor and sensory grasp neuroprosthesis to support individuals with high spinal cord injury in everyday activities.